I convinced several people to take a mountain gorilla trek side trip to Zaire during one of my Kenya/Tanzania trips. The journey from Nairobi to Zaire was worth a separate story in itself but once there and settled in we began our daily treks. You are at about 9,000 feet in Virungas National Park cloud forest so trekking with camera gear ain't exactly easy. However, once we found the small group of gorillas all the pain went out the window. This was, and still is, the most significant encounter with wildlife I have ever had (even beats my diamondback rattlesnake bite!). The mountain gorilla is a highly endangered species and, even now, years later, still only numbers in the few hundreds in the wild. 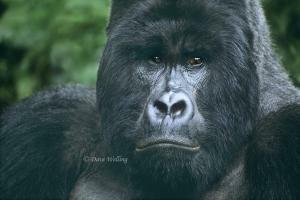 This silverback, Rugabo, kept a close watch over his small group and was a very protective father. You can see him interacting with a very young gorilla in another one of my gorilla images on this site. Sadly, not long after I left Zaire, Rugabo was killed by poachers. He was one of the few mountain gorilla silverbacks alive and he will be missed. Look deeply into those eyes. There is power and strength there that is hard to fathom. So long, Rugabo, friend- I will miss you!